What a difference an artist makes. Scott Kolins is back solo on the art in Blue Beetle 16, and this issue feels so much better than the previous one, even though both were written by Sebela, and the storyline continues directly. The two page spread on pages 9 and 10 contains one of the best illustrations of Jaime Reyes in his Blue Beetle suit that I have seen. Even when not in costume, he and his friends are rendered with perfect detail, and a lot of emotion. 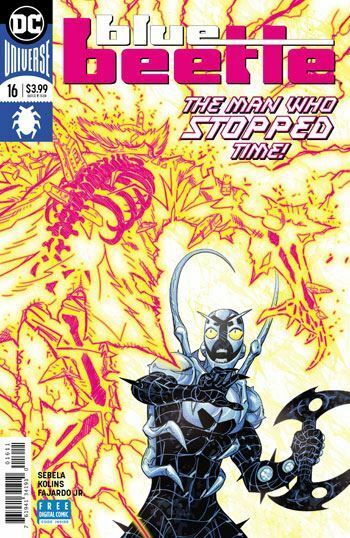 The story pays off last issue’s build up well, and there is plenty of dynamic action as Blue Beetle deals with a time displaced mad scientist, a character of enjoyable menace. But even more traumatic, for Jaime, is that he finally discovers, after far too long, that his friends Paco and Brenda have fallen for each other. They have been concealing this from their friend, afraid that Jaime would not take the news well. And, indeed, he doesn’t. His reaction is childish and extreme, and fully appropriate for a character of his age. Well done. True, Giffen’s banter is sadly missing from this issue, but on the whole Sebela is doing a creditable job carrying on with the book. But one really cannot ignore how much Kolins is bringing to the series.